I did not want to blog already for today but since my fingers are itching for some action, I think I'll give it a go. Besides, I need to do some good ol' ranting here. The story goes something like this. It was one fine afternoon like any other normal day. 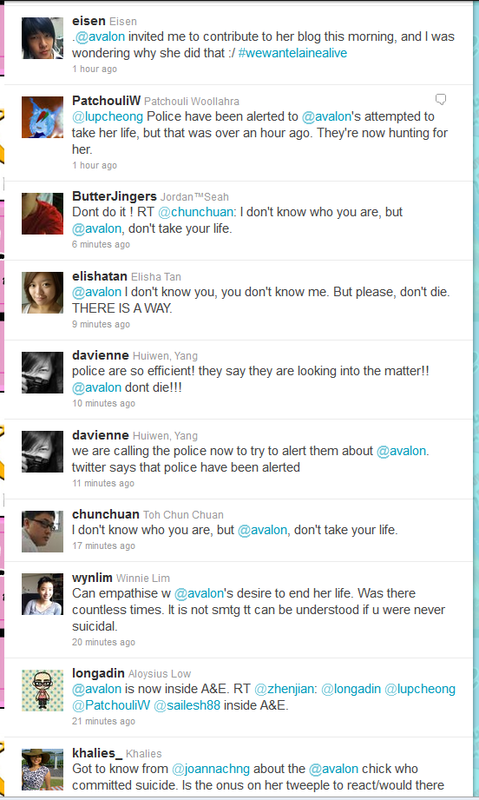 I was busy browsing through Twitter as I was bored from getting all stressed up about my presentation when I spotted a tweet from a friend about calling the police to alert them about a possible suicide attempt by a girl who goes by the twitter handle @avalon. I thought it was a joke at first but after asking the friend of mine and after browsing through @avalon's tweets, it sounded pretty serious alright. As I was sitting far away behind a computer keyboard and as the best possible action has been done (by alerting the authorities), there was little I can do aside from watching the news unfold in Twitter. I do not have the whole details of what exactly took place, but according to tweets from her friends, the suicide attempt was thwarted and she is now warded in Changi Hospital. 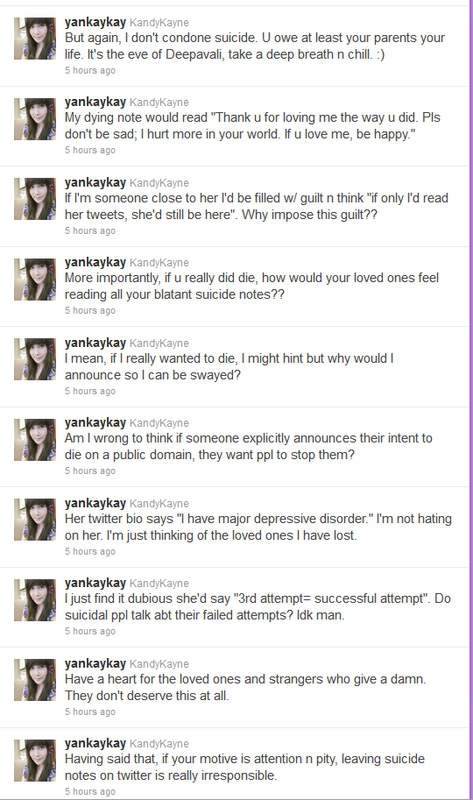 While it's heartening to read of tweets that gave support and urged her to reconsider, on the uglier side, there was also people who condemned her with comments such as why she had to announce to the whole world when she's committing suicide and what she's doing is nothing but a bid to seek attention. And people wonder why no one chose to stop and helped the toddler girl in China when she was lying injured on the road. Reading those tweets like that, no matter how pragmatic they sound, I can't help but to think that they are in a way saying that if these people want to die, just let them die. Why bother to stop them in the first place? After all, it's only maybe a bid for her to gain attention. There's nothing worrying about it. Heck, if you think that she's merely trying to gain attention, then perhaps you shouldn't tweet about this incident in the first place. Aren't you trying to gain attention as well by tweeting your views (a controversial one) about it as well? Why not just ignore it? The thing is, people tend to think of suicide as a choice that we can all freely take. It's like deciding whether to wear a red shirt of a blue shirt today. If you choose suicide as a way out, then you're weak because you're taking the easy way out instead of choosing to face it head on. I used to think like that too. It's how our society tries to demean the people who tries to commit suicide to discourage us from doing it but in their effort to do so, gives us a wrong impression on the people who attempt suicide. If it was that easy, you wouldn't have people killing themselves everyday and clinical depression listed as a mental illness that needs to be treated. You see, unlike the normal moodiness that we might feel everyday due to poor exam grades or an argument with a friend, clinical depression is perhaps a 100 times worst than that. While our mood will probably turn better with a bite of chocolate, the situation faced by people with depression is far worse. It affects your ability to function normally in your everyday life, some people can't even get out of bed and it has a serious implication if not treated. And it is NOT a choice. People with clinical depression cannot choose to be happy or sad as they would want to like us who do not have the illness. It goes beyond the power of the mind. You cannot just get well when you want to. It takes more than pure willpower to overcome depression. Treatments for clinical depression includes medicines and also psychological interventions. And for a large number of times, the interventions may not help too. Mental illnesses is different from your regular cough or flu where everything can be solved with an intake of a medicine. So unless you had a clinical depression before (self diagnosed depression doesn't count) and lived to survive it purely based on your own willpower, you have no rights to comment on @avalon's tweets because you have no idea what a person with depression is going through. Whenever a depressed person talks about suicide, it's usually not a harmless bid for attention but a sign of real distress. Researches have shown that healthy people, people without depression, do not normally think of suicide under stressful situations. Suicidal thoughts is caused partly by chemical imbalance in the brain and heck we don't get to decide what our brain decides to secrete. So please don't assume that everyone is the same as you. We're all different. Think before you make assumptions about a person. The whole idea of "if you wanna go, just go. Don't bother us or try to save yourself." This is extremely sad and you can tell how ignorant many people are. 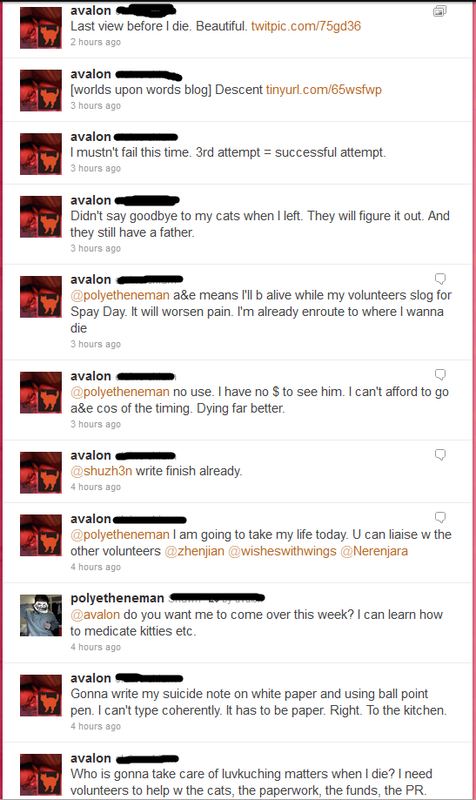 @Avalon is a friend of mine and I know her condition is a serious one. I was there at changi beach desperately searching for her. And to hear what these people are saying when Avalon was in a bad condition and so many of us were desperately trying to reach out to her, it's like a stab right to the heart. 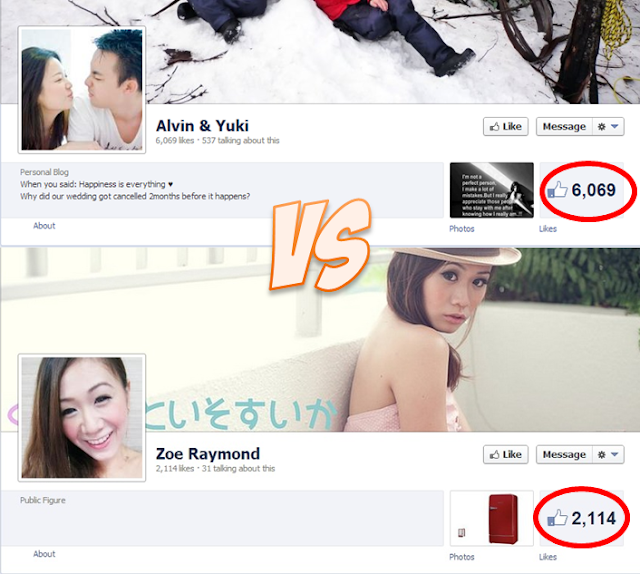 sighh. can't believe there are people like that. as much as I dislike Kay Kay, I believe she has a valid point. if you are so determined to kill yourself, just do it. Stop being such a bother. Just do it, enough said, why with the notes and tweets - why? It's called being selfish, she's not depressed, just selfish. and selfish people kill themselves cos they don't bother about people who actually care for them and they're too selfish self absorbed to notice how lucky she is to be breathing. People all around the world are dying and they would trade anything to be in her shoes but she selfishly decides to end her life.